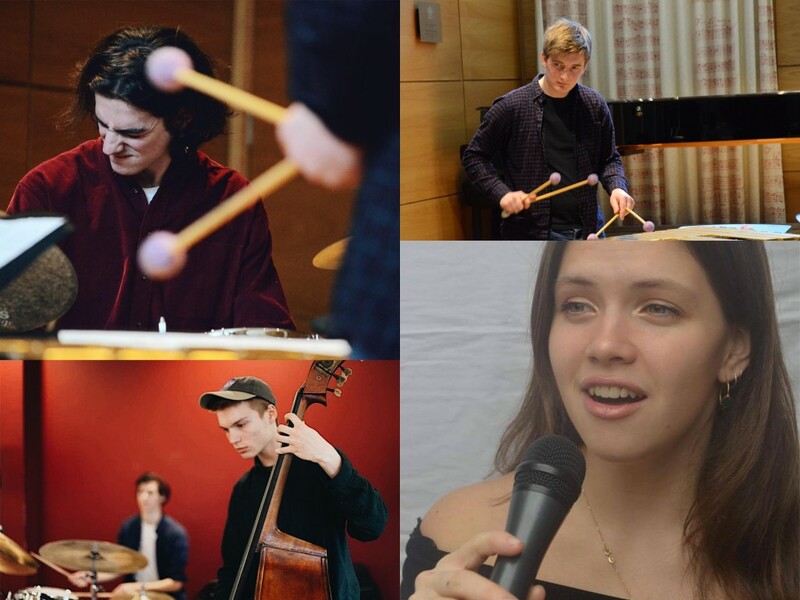 “The unusual line up of bass, drums, voice and vibraphone adds to the unique sound created by the Ella Hohnen-Ford Quartet, a vibrant jazz/cross-genre quartet of passionate young players, currently studying at the Royal Academy of Music and Guildhall. With influences ranging from the jazz greats (such as Ella Fitzgerald and Shirley Horn), to modern composers (including Kenny Wheeler and Marius Neset) and singer-songwriters such as Nora Jones and James Taylor, the group have a truly individual and confident sound. A debut performance not to missed, featuring arrangements of songs we love and compositions written by and for this specific line up. 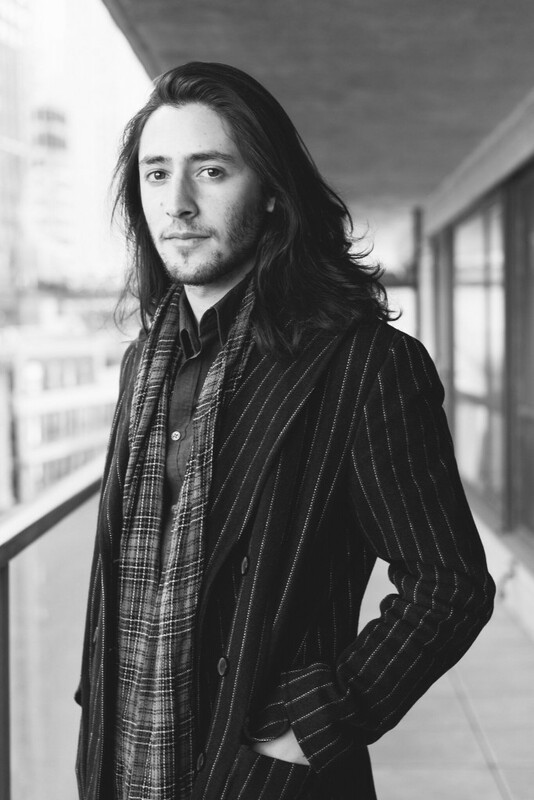 “Gabriel Zucker’s indie jazz orchestra The Delegation was founded in 2013, and has already broken new ground in New York’s dynamic music scene. Combining an array of disparate influences into a unique and emotionally immediate sound, The Delegation has performed throughout the Northeast and Canada, and Zucker’s compositions for the group have received awards from ASCAP and the American Composers Forum JFund grant. The group’s singular musical philosophy has been profiled at length by the Ottawa Citizen, Jazz Gallery, and the American Composers Forum. “‘Evergreen’ also received 4.5 stars in ‘Downbeat’ and 4 stars in ‘All About Jazz’. With protean production by Zucker and pop producer Chris Connors, the nearly-two-hour record features everything from angular rhythmic grooves to Radiohead-inspired soundscapes to jarring electronics-infused chamber music to enigmatic lullabies, and is one of the year’s only contemporary releases on the prestigious ESP-Disk label. “TEXTURE is an original drums/keyboards duo project of drummer, percussionist and composer Adam Teixeira, featuring Chris Pruden on analogue keyboards and synthesizers. Based in South London and Berlin, the two musicians began playing together in Toronto, Canada in 2012 and have since performed across North America and Europe collaborating with a variety of international musicians. Longer-term readers might remember that I’ve got a soft spot for the old Spitz jazz events near Liverpool Street, so it was particularly nice to hear about the first of these five shows below. Our stalls will stock unique clothing and books, featuring items from various independent designers including Marvin Browne. Quite aptly, BBC Radio 3 broadcaster Kevin Le Gendre, who wrote the article on the last night of the Spitz, will be compering the event. “Afro-Palace Live Sessions is proud to present the official UK album release party of Jungle By Night‘s fourth album. 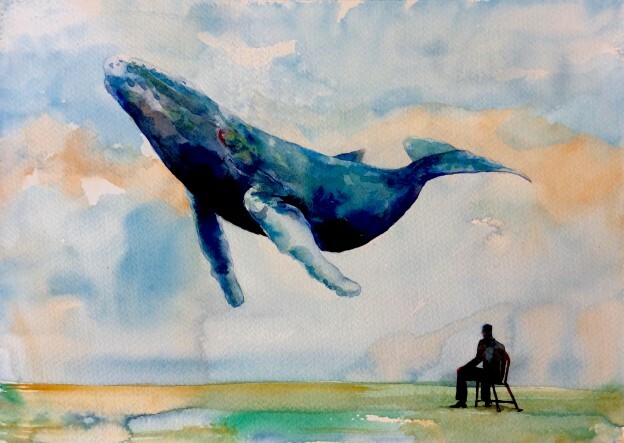 ‘The Traveller’. Jungle By Night consists of nine young swinging musicians from Amsterdam with an eclectic musical upbringing, taste, backgrounds and unstoppable eagerness to produce a unique blend of musical styles. Jungle by Night has turned many dance floors into boiler rooms: from Istanbul to Tokyo and from Paris to the North Sea Jazz Festival via Shambala and Glastonbury. No one can withstand their Ethiobreaks, Middle Eastern psych and syncopated Afro-funk. 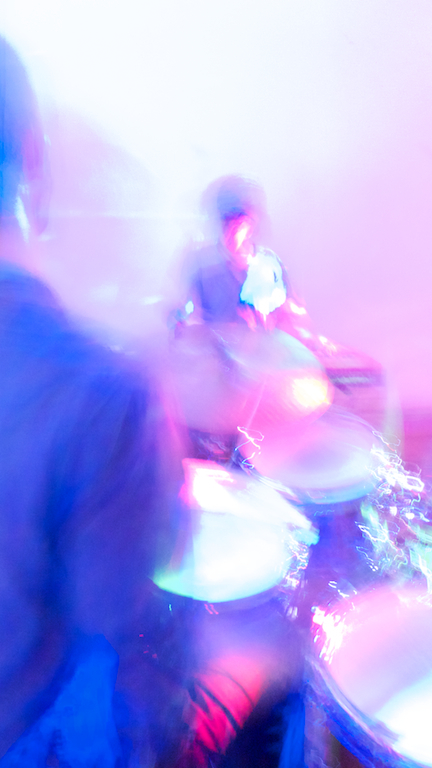 “Electro-salsa meets free improvisation: led by composer-improviser Andrew Hall, Arcadio have been performing since February and bring together London’s finest improvisers and percussionists to create a nomadic exploration of rhythm and movement. The result is a hypnotic music which blends the fierce energy of salsa and cumbia, the delicate unpredictability of improvisation and the cut of modern synths. 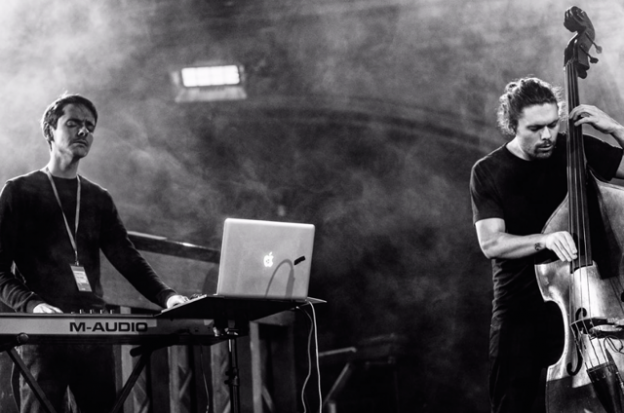 “The members of Arcadio are frequent collaborators and performers across the many music scenes of London. They have performed together with the Balkan/funk big band Mimika, and individual members play in bands of free improvisation (White Flower), pop (Charlie Puth), and even Iranian metal (Ali Azimi). Together, inspired by bandleader Andy Hall’s trips to South America, they perform free-wheeling sets of Latin-influenced groove, building spontaneous layers of acoustic and electronic sound. They get deep into the rhythms, and emerge somewhere on the other side of an hour. 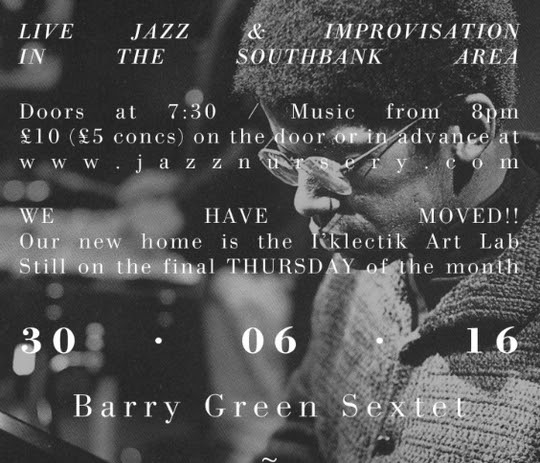 Jazz Nursery present another double bill at their recent new home at IKLECTIK. 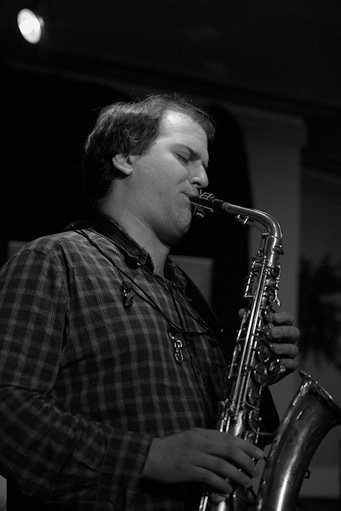 Flexible post-bop pianist Barry Green leads a sextet featuring Miguel Gorodi (trumpet), Sam Braysher (alto saxophone), Tom Barford (tenor saxophone), Flo Moore (bass) and Will Glaser (drums). They specialize in “spontaneous, melodic” jazz. Vortex Jazz Club, 11 Gillett Street, N16 8JH. “To round off this season of LUME at The Vortex, we’ve got an exciting double bill of new and improvised music. “Entropi is a vehicle for Dee Byrne‘s ‘space-jazz’ compositions, exploring a narrative of life-pondering, stargazing and risk-taking. Juggling order and chaos, composition and improvisation, the group takes listeners on a journey with compelling group interplay, strong themes, open-ended improvisation, dark grooves and interweaving melodic textures. The ensemble comprises Dee (on alto saxophone), trumpeter Andre Canniere, keyboardist Rebecca Nash, drummer Matt Fisher and bassist Olie Brice. Having performed live together for some time, the band has achieved a striking empathy and freedom to take risks. Their debut album ‘New Era’ was released on the F-IRE Presents label in June 2015, with their second album to come on Whirlwind Recordings in 2017. “‘I formed this trio last year as a means to play music with an emphasis on spontaneity and improvisation. I have another project, a septet, which is all about detailed written compositions. This trio is the antidote to that. I will be performing with two fantastic improvisers: US drum legend Jeff Williams (who has played with everybody, including two of my favourite saxophonists Joe Lovano and Stan Getz) and Conor Chaplin on bass (who plays in many of the most exciting new UK bands at of the moment). Led by up-and-coming guitarist Tommy Remon, this quartet has emerged from the Tomorrow’s Warriors Organisation, which encourages young British jazz talent (focussing on people from the African diaspora, with an additional focus on encouraging girls and women into the form). Currently playing hard bop and modal tunes from the jazz canon, as well as their own original compositions, the band are at a self-confessed early stage despite their collective musical strength, and are hungry to develop further insight and breadth. Now, however, is the ideal time to catch them while they’re young, hungry and open, and about to start on their first significant expansion. The other members of the band are double bass player Rio Kai (who’s played with Jason Yarde and Alex Garnett), drummer Patrick Boyle (Tomorrow’s Warriors Big Band, Nathaniel Facey) – both of whom previously worked with Tommy in a trio – and trumpeter Dylan Jones, who’s still an undergraduate at Trinity Laban, but is already a member of EZRA Collective. Between them, the band members have also worked with Tomorrow’s Warriors founder Gary Crosby, Nérija, Binker Golding and Kokoroko. 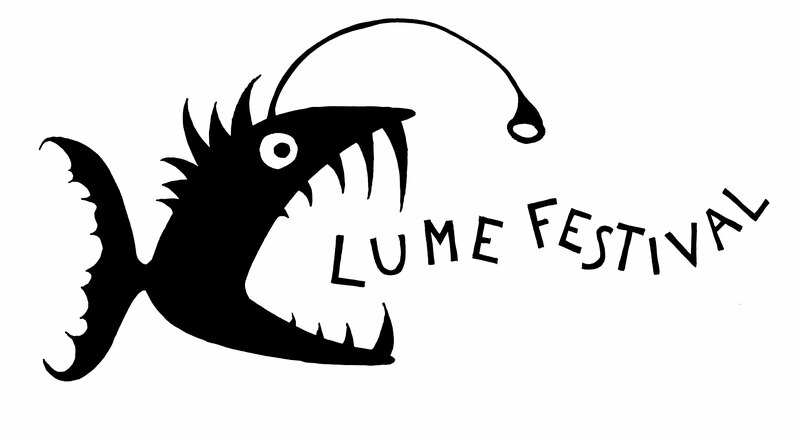 Three weeks later we’ll be back with LUME, who are summarising their current state of play via their first festival, which they successfully crowdfunded following an appeal earlier in the year (with backup from Arts Council England, and the Austrian Cultural Forum). It looks as if it’s going to be both a broad and a familial occasion, with many LUME regulars reappearing in a variety of bands and contexts, with strong playing contributions from the LUME organisers themselves, and with a substantial presence as regards the female jazz musicians which LUME in part encourages (just over a quarter of the twenty-seven players involved are women, most of them also being group leaders, co-leaders and composers). Tickets are limited and are going on sale at the start of June. The day’s headliners are Word Of Moth, the London-based collaborative quartet which includes the two LUME founders on saxophones (Dee Byrne on alto, Cath Roberts on baritone) alongside Seth Bennett (bass) and Tom Greenhalgh (drums). 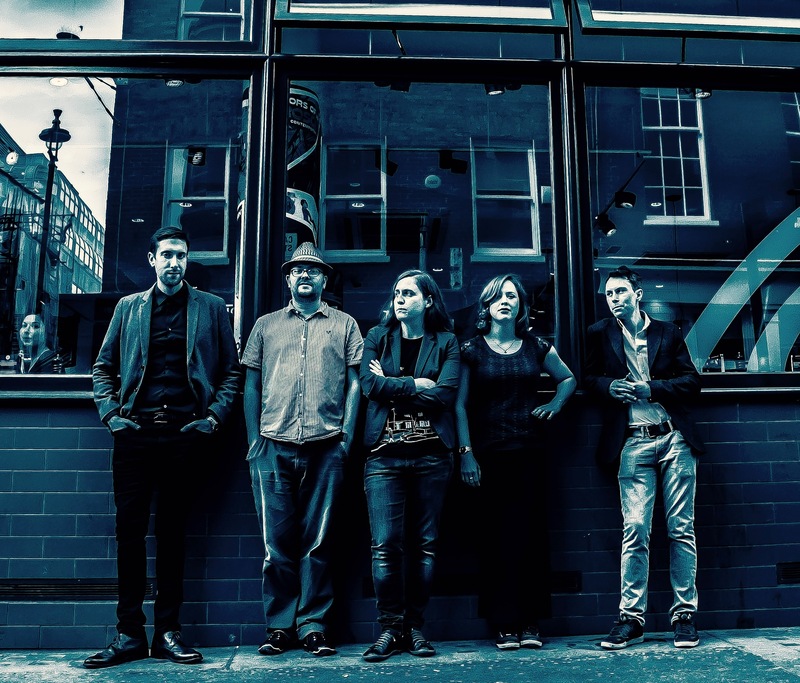 Article XI is a freewheeling large ensemble led by guitarist Anton Hunter, originally put together for the 2014 Manchester Jazz Festival but deemed too good not to continue with. Mingling free improvisation with tightly-composed contrapuntal writing, it also features Oliver Dover (alto sax, also of Saxoctopus and many others), Tom Ward (tenor sax), Cath Roberts (baritone sax), Johnny Hunter (drums), Seth Bennett (bass), Graham South and Nick Walters (trumpets), and Tullis Rennie and Richard Foote (trombones). Vienna-based Blueblut was founded by three musical powerhouses, famous in their respective spheres of jazz, electronic and avant-rock music. The band have the intensity of rock, the space and openness of electronica and the razor-sharp precision and wild improvisation of jazz. Featuring Led Bib’s Mark Holub on drums, Pamela Stickney on theremin and Chris Janka (flying machine maker, sound engineer, automata creator and Viennese Caractacus Potts figure) on guitar and overall production. Musson/Kjær/Marshall are a fantastic London trio of committed European-scene improvisers and extended-technique instrumentalists, all of whom happen to be female: Rachel Musson (tenor sax), Julie Kjær (alto sax) and Hannah Marshall (cello). Little Church are a Birmingham-based fusion quartet, playing compositions both from and inspired by Miles Davis’ electric period. 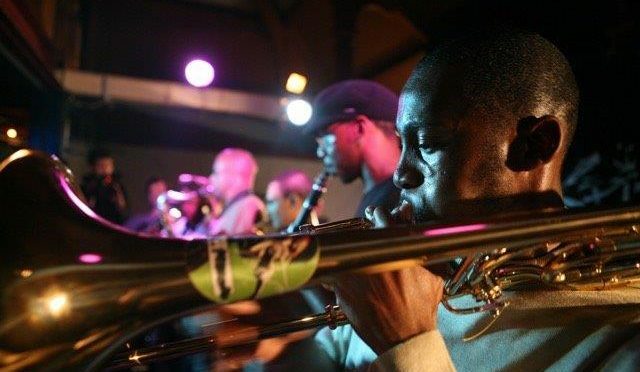 Led by keyboard player David Austin Grey, the rest of the band is made up from Aaron Diaz (trumpet), Rachael Cohen (alto sax), Chris Mapp (double bass, bass guitar and electronics) and Tymek Joswiak (drums). Little Church fuses live acoustic instruments with synthesizers and electronics to produce a wonderfully ambient soundscape, which moves from meditative and hypnotising through to driving and funky with a seamless fluidity. Ant Traditions are a top-notch Manchester improv duo featuring Adam Fairhall (toy pianos) and Dave Birchall (electric guitar).